Martha “Molly” Elizabeth (Winch) Asher, 83, longtime resident of Williamstown, MA died on Saturday, March 17, 2018 at her home. She was born in Pittsfield, MA on July 12, 1934, a daughter of the late Ralph, a former physics professor at Williams College, and Mary (Johnson) Winch. Mrs. Asher attended schools in Williamstown, graduating from Williamstown High School. 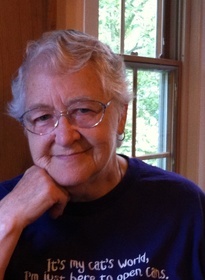 She went on to attend Williams College, graduating with the class of 1955. She stood among a handful of women who pursued full-time study at Williams in the 1950s, two decades before the college officially admitted female students. She went on to complete her Master’s degree in 1981. Mrs. Asher married her late husband, Anil P. Asher, who was also a graduate of Williams College. They moved to Kolkata, India where they lived for 12 years. After returning to Williamstown, eventually she became Registrar at The Sterling and Francine Clark Art Institute, a position she held for many years. She published short stories and poetry as a young woman, and in later years published an extensive, respected translation of Lancelot-Grail: The Old French Arthurian Vulgate and Post-Vulgate. Her friends will remember her as intellectually curious, open minded, and an avid reader on a wide range of topics. Survivors include several nieces, nephews and friends. She was predeceased by a brother Roger Holmes Winch who died in 2012 and a sister Katherine Winch Wrigley died in 1998. At Molly’s request there will no funeral services. Memorial donations are suggested for the Second Chance Animal Shelter, P.O Box 620, Shaftsbury, Vermont 05262 or Berkshire Humane Society, 214 Barker Road, Pittsfield, MA 01201. To add to the Book of Memories, please visit www.flynndagnolifuneralhomes.com.